King prawns (Litopenaeus vannamei) with red peppers and parsley and a smoked paprika, chilli, pepper, garlic and parsley dressing. 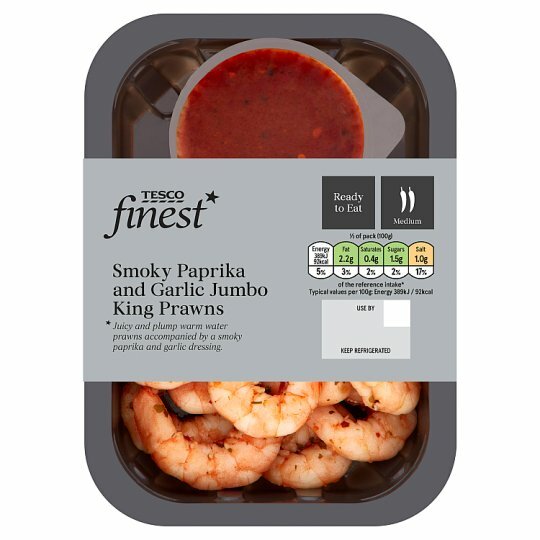 Smoky Paprika and Garlic Jumbo King Prawns Juicy and plump warm water prawns, gently cooked to enhance their naturally sweet flavour. Marinated in red pepper and parsley and served with a pil pil style dressing made with smoked paprika, chilli and garlic. INGREDIENTS: King Prawn (Crustacean) (73%), Pil Pil Dressing (25%) [Water, Tomato Purée, Garlic Purée, Red Chilli Purée, Rapeseed Oil, Lemon Juice, Smoked Paprika, Cornflour, Salt, Chilli Flakes, Black Pepper, Cayenne Pepper], Salt, Flat Leaf Parsley, Dried Red Pepper. Keep refrigerated. Once opened, use immediately., Not suitable for home freezing.